Are you in the market for a file sync and share service for your business? Then you probably know there’s a bit of controversy surrounding Dropbox these days. 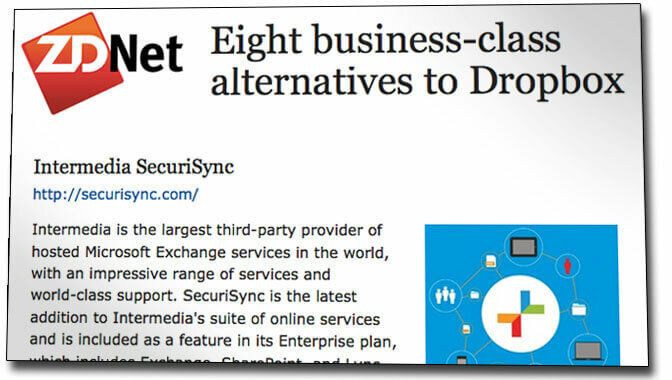 Technology news giant ZDNet put together a list of 8 enterprise-grade alternatives to Dropbox — and one of them is Intermedia’s SecuriSync. SecuriSync offers the perfect balance between user simplicity and IT protection and control. ZDNet called out a number of key reasons why SecuriSync beats Dropbox, including Intermedia’s “world-class support” and its integration with Office apps. Be sure to read the entire article and learn why SecuriSync is gives Dropbox a run for its money. Or learn much more about SecuriSync. SecuriSync wins a Stevie Award!